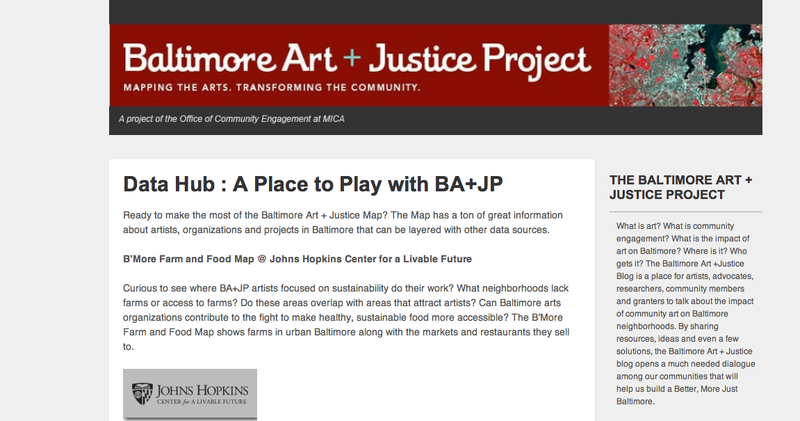 At Baltimore Art+Justice, we’re always looking for new ways for members to use our map, so we’re excited to announce a new part of our website: the Datahub, a resource for researchers and anyone interested in the ever-changing cityscape of Baltimore. Want to see how crime statistics and the establishment of arts districts are related? Want to explore how Baltimore artists and organizations can contribute to the fight to make food more healthy, sustainable, and accesible? Want to find a vacant lot to do a project in? Investigate these questions and more at the Data Hub: A Place to Play with BA+JP. If you think of a cool new way to use these or other resources, let us know at baltimoreartplusjustice@gmail.com. Artscape starts today, and BA+JP is very excited! Artists, performers, and tourists from all over the country and world will be in Baltimore. Deciding where to go can be a bit overwhelming, so here are a few possibilities for those who want to focus their Artscape visit on Baltimore locals. Showcasing local farmers, bakers and brewers during Artscape weekend in the Station North arts District’s North side. featuring artists Rick Cleaver, Jim Condron, Robert Creamer, Kurt Godwin, Katie Pumphrey, Nancy Scheinman and Ronnie Spiewak. Join Baltimore Heritage for “Station North by Foot:” a free one-hour tour through a rich history of art, music and architecture within blocks of Artscape. The Alternative Art Fair features displays from more than 15 non-profit exhibition spaces, pop-up venues, artist run galleries and artist collectives. All of the participants embody a DIY approach in the way they curate, organize and promote their shows. The work on display will range from traditional painting and sculpture to temporary installations built specifically for the fair and new media works. After teaching Science/Math for 10 years, and while teaching art part-time, Melissa Moore started the product design studio, Nikkuu. During her time developing the design studio and volunteering with various community youth programs in Baltimore City, she was envisioning Y-LLEAD. Upon receiving an Open Society Institute Fellowship in 2013, programming for Y-LLEAD began in early 2014. The foundations of her work are centered around the intersections between design, alternative learning spaces, healing justice, spirituality, anti-racism, community collaboration, and new solidarity economies. What is your name and organization? Which neighborhood do you live in and which neighborhood do you work in? I live in Ednor/Waverly. I work in many neighborhoods. The work is not “job” work, but relationship building, connecting work, necessity work that goes way beyond “job” work. Since the various community work that I do is so inter-connected and based on engaging in what is needed at the time (no matter what neighborhood I’m in), I see my work as very mobile, organic, and dynamic. I’m constantly addressing social justice in my life all day/everyday. It is not separate from my day-to-day life. Working in the community takes me to various neighborhoods in the city, which is really important to me. As Y-LLEAD evolves, our work is actually meant to be even more collaborative with other youth organizations around town. Our studio is currently located in Greenmount West and we are being hosted by the Baltimore Design School. Describe your art or organization? 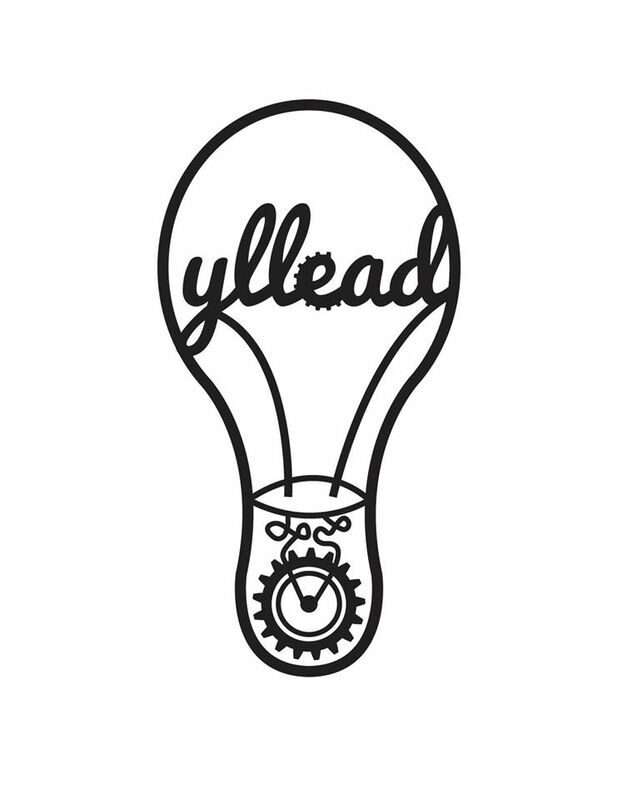 Y-llead is a youth led design program that uses architecture, product and graphic design as a tool for social justice and self-actualization. We see these as amazing tools for providing intensive learning opportunities and knowledge exchange. We collaborate with young people in the process of harnessing their creative capital to design and develop community projects. There is also a social enterprise segment of our work that allows young people to combine social justice work with entrepreneurship while working on products that fill a need in the community. Currently, Y-LLEAD designers are doing work around healthy food access and community play-space development. We see grassroots development of community green spaces as not only a way to re-activate neighborhoods but a way to also create health and healing opportunities within communities and for potential small entrepreneurship opportunities to unfold. Community collaboration, relationship building, self-actualization, and sustainable life-long learning for youth are at the heart of Y-LLEAD’s mission. Right now, we are in our summer design intensive. Y-LLEAD designers have been delving into the question of how social justice connects with their own lived experience and communities. They are designing and developing a multi-use community green space in the Greenmount West neighborhood. They have been connecting with the neighborhood, having door-to-door community conversations asking multiple generations of neighbors (from 3 year olds, to other teenagers, to elders) what they envision for their neighborhood. They have also been collaborating with a landscape architect, and soon with urban farmers. The Y-LLEAD designers are really excited about the work that they are doing and have talked about how empowered they feel in seeing this work slowly come to fruition. None of them have really been given the space to talk about social justice and certainly not about how they as youth can be the leaders of this work and how they might use their passion for design to bring about important change in their communities. What inspires me most are the people in my neighborhood and community (in Baltimore and beyond) who are the most marginalized and dehumanized but have still managed to do their best to navigate life with what has been given to them, including my own family. Their suffering inspires me to help develop and uplift new futures. It is the reason I am on the planet at this time. In my experiences in the US, these are African-American people first and foremost. To have been stolen from ancestral land, turned into property, have this in our DNA for hundreds of years on land that was also stolen in colonization and then thrown into a system that was designed and developed on the backs of black dehumanization (and still is) and to exist in the variety of ways that we are with the brilliance and resilience with which we do it, is incredibly inspiring. It is painful and beautiful. There are other things that inspire me too. A range of people, places, and things here in Baltimore, the US, and beyond inspire me. My Buddhist teachers sharing ancient wisdom, my African ancestral wisdom traditions that I’m still uncovering, my indigenous Cherokee ancestral wisdom traditions that I’m uncovering all inspire me. What’s the best part about being an artist or running an arts organization in Baltimore? Being an artist/designer in Baltimore allows me access to things that make it much easier to develop and share my work. One example is access to a well-developed tool library (Station North Tool Library), free Fabrication Lab access and accessible living costs (although I know for some people this is not the case and because of gentrification, less access to affordable housing is available in the city). Also having the space as a designer/artist to experiment and start stuff without there being thousands of other people trying to do the same thing or competing for the same access or resources. Red Emma’s knows that you never get a chance to hang out with many of your favorite people in Baltimore because everyone is too busy organizing to overthrow capitalism, confront imperialism, destroy racism, and smash patriarchy, heterosexism, and cisnormativity. So they’re starting a monthly social justice organizers’ happy hour at Red Emma’s—spread the word to your colleagues and comrades, and come by for an early evening of conversation and catching up. When: Thursday July 5th, 5:00 pm. Where: Red Emma’s Bookstore Coffeehouse, 30 W North Avenue. How: $1 sodas, and $1 off beer and wine. About Red Emma’s: Red Emma’s is a worker owned radical bookstore and cafe. Happy Fourth of July from everyone at BA+JP!